(Wellesley, Massachusetts) A Piece of My Heart is a drama about five nurses and one singer who voluntarily travel to Vietnam for one year during the Second Indochina War. This cast of patriots did a terrific job recreating the emotional bonds of friendship that form between those in war zones. The performance by Jenna Lea Scott was especially moving. Scott’s character was a nurse named Leann, a starry-eyed Asian-American duped into enlisting when a recruiter insinuated she could be stationed in Hawai’i. Leann was inspiring because this character’s inner fire was never extinguished, despite the constant chaos of the combat zone and the upsetting injuries she had to tend to in her medical ward. Scott’s presence and voice were sturdy and strong. When she shouted in desperation “Show me what to do!”, when she whimpered in agony “And half the soldier’s face is gone,” Scott’s character Leann became a mirror providing insight into the nightmare of bloody war. In this strong ensemble, Leann’s grit was most conspicuous to me. This character’s betrayal by her country cut me deep as an audience member. After returning to an ungrateful America, Scott/Leann howled with blood-curdling fury “I could kill! You don’t know, I could kill!” Leann had dreamt of Hawai’i, but instead she got shafted with the Vietnam War plus a lifetime of PTSD. I was mad with and for her. It was the first time I cried at a play, tears rolling down my cheeks and dripping from my chin. In this review, I have focused on casting because it was nearly perfect in this production. I have worked with two of the actors in other performance spaces. I have seen and enjoyed two of the other actresses in previous plays. I’m coming to know Boston’s theatre landscape pretty well, and those in A Piece of My Heart were some of the best actors performing on the local stage right now. This docudrama is at the Ruth Nagel Jones Theatre for two more weeks until 24 June 2018. 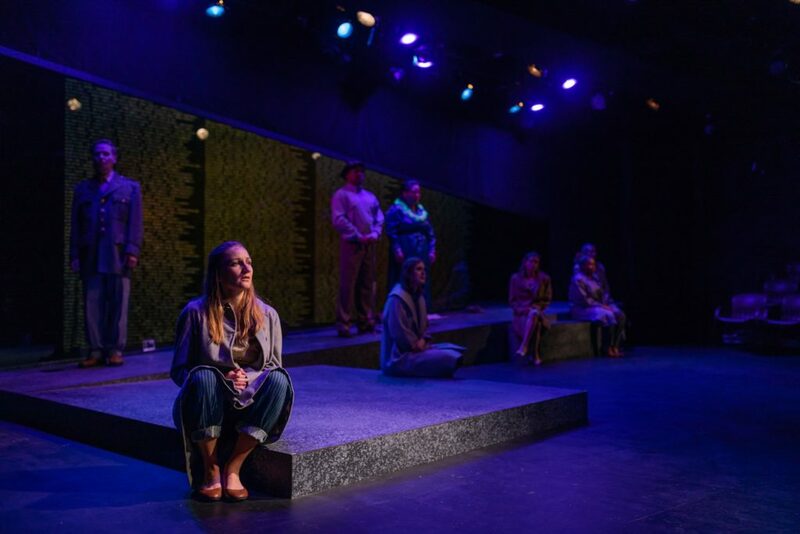 A Piece of My Heart is a true story recounting experiences of women in the Vietnam War who watched sweethearts get blown up after stepping on landmines, but who also resist each tragedy with song and solidarity and sisterhood. During this week when we are commemorating the 50th anniversary of Bobby Kennedy’s assassination, I urge you to see this play about historical women veterans. This entry was posted in Drama and tagged A Piece of My Heart, Alan White, Andres Lyman, Ariela Nazar-Rosen, Bishop C. Knight, Bobby Kennedy's assassination, Danny Bolton, Hawai'i, Jenna Lea Scott, Kevin Walker, Marge Dunn, Nora Hussey, PTSD, Ruth Nagel Jones Theatre, Sarah Lord, Second Indochina War, Shirley Lauro, Veterans, Victoria Georgia, Vietnam War, Wellesley Repertory Theatre by Bishop C. Knight. Bookmark the permalink.